Kali Katerberg/Daily Mining Gazette Ontonagon EDC President Sue Preiss listens to recommendations for expansions to railroad and airport facilities. 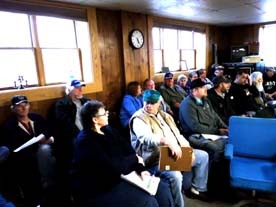 ONTONAGON — As new industry moves into the area, the Economic Development Commission (EDC) anticipates transportation upgrades and expansions will be necessary. At their Wednesday meeting, EDC members opened discussions regarding transportation for incoming companies like the planned Synsel biofuel refinery. Two major areas of focus were railroad upgrades and extension of the airport runway. The railroad additions in particular will be crucial for the incoming industry. Previous landowners removed 12 miles of track, and now the DNR operates a snowmobile trail on it. Replacing the track will require extra planning and time, as a new snowmobile trail will need to be opened to replace it, member Skip Schulz said. The rail bed that now has the snowmobile trail on it is the only railway and snowmobile trail in and out of Ontonagon. The rail will be crucial for moving materials to the biofuel plant at the bare minimum and it will be necessary to push hard to get it back, Tucker said. According to Tucker’s research, the state government is required to use the land for railroad if it is needed, returning the land to its intended use. “If there is a need for the railroad, it must be railroad. They cannot say, no, we’d rather have a snowmobile trail. That’s not within their jurisdiction and power. Schulz recommended moving the snowmobile trail immediately to get momentum for restoring the railway rolling. He suggested reopening the old snowmobile trail that was closed in favor of the one occupying the railroad area. If the railway returns, it would benefit not just Ontonagon but also Rockland and Mass City, Tucker explained. “It never should have left,” he said. At the airport, expansions are also being considered. 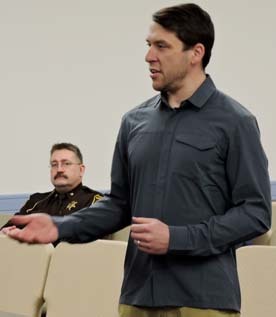 “I got a call from some of the companies involved with Synsel that want to be involved in engineering here, construction here, contracting here, with a bunch of the various part of this project… and what I learned is that almost all of those companies have planes and want to fly into Ontonagon,” Tucker said. However, the runway is an issue. At 500 feet less than the recommended standard length, larger planes would not be able to land there without risk or difficulty. The airport’s five-year plan calls for an expansion to a 5,000-foot runway, enabling small jets to land. A larger fuel tank was also recommended to provide adequate refueling service for the larger planes and jets.